Maechee Nalinrat Sutthithamvith’s goal in life is to promote the continuation of Buddhism. This continuation of Buddhism she encourages through development of the human heart. A nun of 38 years, she ordained in her youth. She practiced meditation intensively, and is now an adept meditation master. Through teaching meditation, she assists monastics on the path and all human beings towards happiness and enlightenment. Her offerings of educational scholarships to monastics and the community display her compassion. The blessings of her practice manifest in her, her students, and at her temple in Chonburi, Thailand. She built her own temple which is elegant and expansive. Buddha Savika Temple is also known as the Daughter of the Buddha Temple. 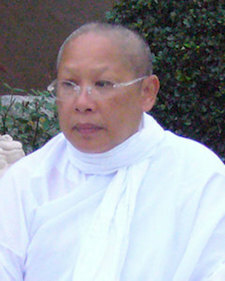 For excellence in meditation and countless acts of compassion, Maechee Nalinrat Sutthithamvith is honored as an Outstanding Woman in Buddhism 2009.